We are happy to celebrate National Doctor Day today by sharing about Healthy Home Pediatrics, based out of Capitol Hill. 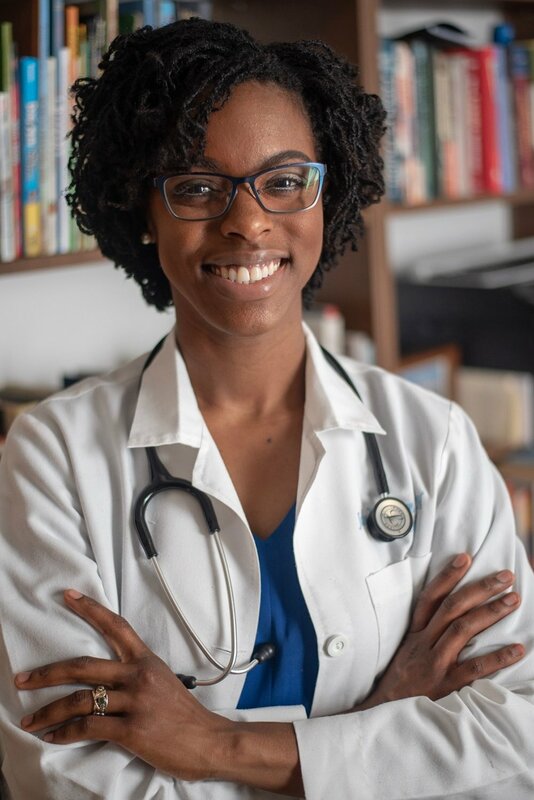 Dr. Jalan Washington Burton provides exceptional primary care for children and young adults in the comfort of home, serving the District of Columbia, Maryland, and Virginia. Dr. Jalan’s visits take place in the patients own home. Her health plans are personalized and tailored to each individuals needs. Her patients have the consistency of building a long-standing relationship with their pediatrician and work with her each time. We hope you’ll reach out to her today to learn more about her unique practice model! I have always wanted to be a doctor. Every single school report and every career day, without fail I researched becoming a doctor. Growing up in Buffalo, my parents signed me up for countless enrichment programs and I was always drawn to biomedicine. I spent most summers shadowing doctors and other healthcare workers. Before medical school, I studied public health with a concentration in health promotion as a way to understand the complex realities of my patients. Looking back, I realize that I have always loved working with others, learning the facts, listening to people’s diverse stories, and then collaborating with those most affected to come up with a plan. Ultimately, Pediatrics was the specialty in medicine that most spoke to my heart. During medical school, I saw children heal from life-threatening injuries and thrive! As Marian Wright Edelman says “Service is the rent we pay for being. It is the very purpose of life . . . ” The time I have spent working directly with families has always been the most rewarding and it is my life-long calling. I love working with children and their families! From brand-new newborns, to spunky toddlers, to feisty teenagers, I love kids! No matter how challenging my days are, I get to work with amazing families every day, it energizes me and makes my life exciting. I launched Healthy Home Pediatrics after gaining over a decade of experience in kids’ health as a way to work directly with families free from the red-tape and bureaucracy imposed by health insurance companies and large hospital systems. I went into medicine to work directly with patients because it is what I was called to do and it’s what I love to do. Honestly, I am still reflecting on my two births, one 7 years ago and one 1 year ago. They were complex and ultimately triumphant, but unfortunately each time I didn’t completely feel “listened to.” Our first was in a hospital our second was at home, each time I had a care team involving my husband, family, midwife, and doula/birth assistant. My youngest just turned one and even though he has experienced some complications, the postpartum period has been a truly fulfilling one. I have a great support network, including my family and a dedicated group of girlfriends. I also worked with postpartum doula for traditional eastern medicine belly binding and compresses. In spite of the challenges, these were beautiful experiences. Where do I begin?!? From a systematic perspective, I am a true advocate of paid maternal and paternal leave. I wish that all parents had intergenerational support, that they didn’t have to decide between being a parent and working while their baby is an infant, and that they had communities that truly supported them. From a care perspective, I wish every family had a trusted Pediatrician who they could reach out to when they needed and that they didn’t have to worry about being able to afford the services they need. This is why I started Healthy Home Pediatrics. One thing that is unique about my practice is that I am able to be responsive in a way that busy parents need and want such as house calls, video, text, webinars, and email. I love the fact that I truly get to know my patients, by spending time with them in their homes and over time, I am able to develop a comprehensive understanding of what my patients need. Sometimes all a busy parent needs is a quick video chat to have a rash diagnosed and know that a child can return to school or a quick text exchange to ask a nagging question. I love it and my patients do to. I think we need more high-quality and personalized health care options for everyone! And by access to care for children I mean, access to a trusted health care provider that coordinates primary care and specialty care, not just access to health insurance. I know far too many people (including me) with access to health insurance who feel like their needs are not being met in the traditional system. Far too many of us feel too rushed and never really know who to ask basic questions. It is rare, but I love when I meet people and they say “oh I love my Doctor and have been with him/her for years!” It warms my heart when I meet people and they tell me that my patients have said this about me - the testimonials my patients provided on my home page truly warm my heart. I never would have imagined 8 years ago before becoming a parent that a brand new little human being could change my heart so much or that I could be so tired. In a blog post I wrote in March 2014, I wrote about how I developed my “big ole fierce mama heart” after delivering my first son. Birthing, nursing, and loving my first little human changed me so totally as a wife and Pediatrician. The hardest part for me was how difficult it is to “balance” work and family life. Thankfully my “village” includes a dedicated husband, my father who watches our youngest and picks up our oldest from school daily, and a host of beloved family and friends. Even with that support, it is a daily juggling act that has been fun to experience! When I working with patients I am able to be fully present due to all of my support and when I am at home. I love getting my hair done, manicures, pedicures, and facials - but honestly I don’t do them nearly as much as I’d like. After being inspired by a close girlfriend with amazing hair, I faithfully get my hair professionally styled every 6 weeks and it has been a game-changer. I have been scaling back on products as a way to declutter our lives and try to use natural, organic products. I love good smelling whipped shea butter and handmade artisan soaps (love Ohene Handmade soaps made by my dear friend Pharmacist Dr. Kofi here in DC). That depends! I used to be a morning person, but we are deep in the midst of sleep training our 1 year old. Now, I find myself trying to catch up on sleep and many mornings I am tired and awake to the sound of my husband telling me it’s time to get up. Then begins the dash to get the oldest off to school on time or change the baby’s diaper before handing him off to my father (who is our Granddad-nanny)! My goal (someday soon) is to start each day with a few minutes of silent meditation, reflection, and prayer. My favorite inspirational books are Paulo Coelho’s The Alchemist and Iyanla Vanzant’s Acts of Faith. Fingers crossed the Little One consistently sleeps through the night soon! Our family tries to spend as much time outdoors as possible. We love all of our national parks, recreation centers, and playgrounds! We live on Fort Dupont/ the Fort Circle Parks and try to hike as much as we can in the spring. I love running or walking along the riverfront at Anacostia Park. Also this is my fourth year as an Urban Gardener and I am so excited to increase our growing of peppers and fruits this year!